Ground pork cooked in a ginger and sesame oil sauce over a bowl of lettuce makes a great quick and easy weeknight meal for the whole family. It’s been a while since I posted a recipe that was inspired by my favorite cookbook, 100 Days of Real Food. We have been using her recipe for Asian Lettuce Wraps for at least a year now but changing it up to suit our tastes (and skills). The original recipe suggests making the pork mixture, then using large pieces of lettuce as a wrap. We tried that. It didn’t work out well at all. The first time we bought lettuce that was big enough, but it just kept falling apart on us as we were trying to hold it, not to mention all the juices dripping out. Needless to say, it was a mess. But we loved the flavor. We tried again. And failed. Again. I put the recipe away for a little while as a lost cause until one day, when Justin was searching through the book for a good recipe when we were doing our weekly meal planning, he suggested we try it again. This time, we bought lettuce with the intent of making it into a salad rather than as a wrap, and it worked so much better. Ever since then, we haven’t even tried to do this as a wrap but always make it into a salad. It’s a bit easier for us, we don’t have to try to buy lettuce that will work specifically as a wrap, and it is nowhere near as messy. But, if you want to try it as a wrap, there’s nothing wrong with that! Just make the pork mixture the same way, but instead of adding it to a bowl with the lettuce, put the meat in the piece of lettuce. In a large saute pan, heat the oil over medium heat and add the carrots. I like to use an electric food chopper (like the one linked below) to chop the carrots up, so they are small, but stop before they become carrot mush. I find this works best if you use baby carrots to start with. Cook the carrots for a few minutes until they are soft but don’t let them start to brown. Add the pork and ginger, cooking until the pork is broken up and cooked all the way through. This usually takes about 10 minutes. Then add the soy sauce, sesame oil, and water chestnuts (which are missing from my photo because we forgot to get some from the store). Heat the mixture until the liquid is almost evaporated, about 3-5 minutes, and stir everything together well. Remove the pan from the heat and fold in the cilantro. Line your serving bowls with chopped lettuce and spoon the pork mixture on top. I like to use a slotted spoon, so you don’t get too much of the liquid in the bowl. Serve warm and enjoy! While I don’t eat pork, my husband does – so he would LOVE this recipe! That being said, I could easily sub in another meat and go to flavor-town with this baby! That photo of your son is priceless! 😀 Salad looks very delicious! Asian Pork salad sounds and looks really good right now. Good for lunch or dinner. This will make for a perfect dinner, not too light not too heavy. It looks really delicious, I’m sure it tastes as good as it looks. This looks like an easy yet healthy meal choice! I’ve never had much luck with lettuce as a wrap so I always end up trying it into a salad. I don’t think I’ve ever actively added water chestnuts to a recipe so I will have to try it! I love light Asian salads and what I like most about them, is how rich in protein they are! I have tasted a similar dish in Lao called larb and it reminds me a lot of your recipe! Nice one! I wish I did not tell the girls I would make tacos today as I would rather make that delicious Asian pork salad. I have everything to make, which means that will be my dinner tomorrow. This reminds me so much of samgyeopsal! a korean dish that features lettuce as the wrap + beef much like this one and it’s so good! This just reminded me to make some again as it’s been years since I’ve had it! Looks so light but so filling! I love this recipe but I stopped eating pork a while back after watching a video on pig breeding. Would this recipe work with something else? What would you recommend? You could try ground beef, it’s a similar texture but a different flavor. Or almost any type of ground meat would cook similarly. If you are looking for a meatless option, I’m not sure what you could sub in for the pork. Yum! This looks so amazing. I love that your little guy helps you cook too!! This looks really good. It reminds me of the chicken wraps that I did. 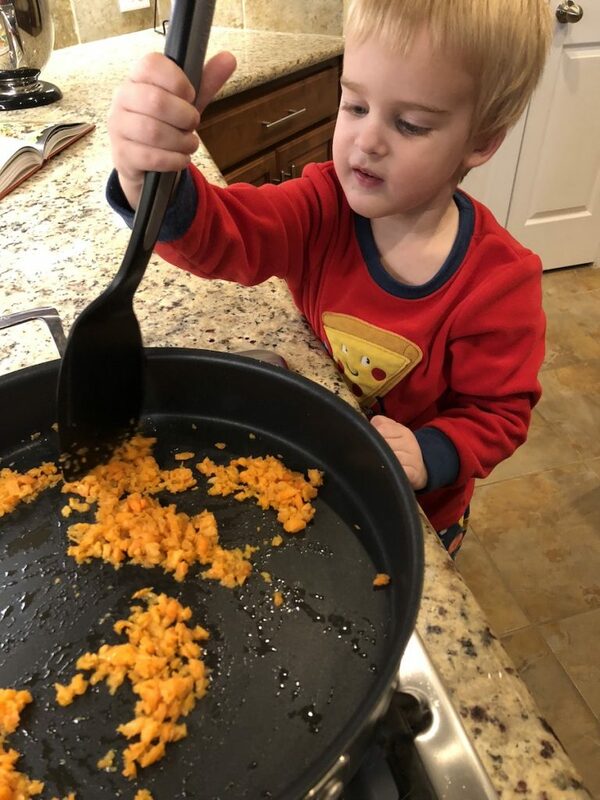 Love that your little guy is helping you out and learning to cook.